Be the first to share your favorite memory, photo or story of Donella. This memorial page is dedicated for family, friends and future generations to celebrate the life of their loved one. Rev. Donella (Grobe) Siktberg, 90, a resident of Concord, MA , formerly of western Massachusetts, died Saturday, October 14, 2017 at Newbury Court in Concord, MA. Born in Duluth, Minnesota on October 6, 1927, she was the daughter of the late William and Bonney (Beal) Grobe. She attended Duluth public schools, Duluth High School and Bethel University in St. Paul, Minnesota. In 1955, she received a Religious Education Degree from New York Theological Seminary and later attended a religious counseling school in Worcester, MA. At the age of sixty, she received a Masters in Divinity from the Andover Newton Theological School in Newton, MA. For many years, prior to her retirement, Rev. Siktberg wes employed at Wesley United Methodist church in Warehouse Point, Windsor, CT. Previously, she was the Director of Education at the First United Methodist Church in Westfield, MA. From 1969-1978 , as a resident of Oak Bluffs, MA Donella was an active member of the community, and of the Martha’s Vineyard Methodist Women’s group. 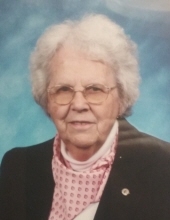 While on MV she taught religious education and coached the MVHS girls basketball team. Previous to Martha’s Vineyard, Donella lived with her family in Coventry, RI and E. Glastonbury, CT and was involved in the Methodist church in each place. A Concord resident since 2004, she was a talented piano player, singer and enjoyed needle point. Survivors include two sons, Nathan Siktberg and his partner, Marco of Reading, MA and Daniel Siktberg and his wife Barbara of Hudson, MA, three grandchildren, Hannah, Nathan and Sarah, her brother, Graden Grobe of Duluth, MN and her former husband, Rev. Carl Siktberg of West Springfield, MA. She was also the sister of the late William Grobe. Arrangements are under the care of the Dee Funeral Home of Concord. To share a memory in Rev. Siktberg’s online guest book visit www.deefuneralhome.com. "Email Address" would like to share the life celebration of Donella Siktberg. Click on the "link" to go to share a favorite memory or leave a condolence message for the family.